The Gramercy brand from F. Schumacher & Co. offers the largest collection of wallpapers and borders for the sophisticated, upper-moderate consumer. 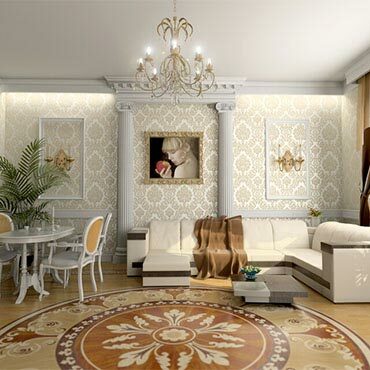 Gramercy wallpapers and companion decorative fabrics are distributed through upscale paint and wallpaper stores, specialty home decor retailers and independent decorators. Gramercy is known for highly-styled, fashionable wallpapers with designer cache. Gramercy is aligned with some of the top design names today, including the Echo Design Group and Royal Doulton's Minton Archives Royal Doulton, marrying haute couture, or fine English bone china with home decor to create a unique and exciting approach to wallpaper. Gramercy designers also expand the boundaries of technology, developing award-winning and innovative techniques to produce unusual effects, such as trompe l'oeil architectural details and faux marble creations. Gramercy collections are designed to fit into a broad range of home interiors and lifestyles, from traditional to transitional, offering selections for consumers with impeccable taste and keen attention to detail.